Concise yet comprehensive, this highly acclaimed training manual and reference provides the many phases of inspection work and their application to today's manufacturing operations through a practical down-to-earth presentation. Discusses a range of manual and automatic measuring devices along with their specific functions and the specialized functions involved in their use. Analyzes the methods and duties of inspectors. Appropriate for use by inspection supervisors, plant managers, quality control engineers and subcontractors. Includes SPC and other data analysis methods for manufacturing applications. Provides detailed discussions of available measuring and quantitative systems. 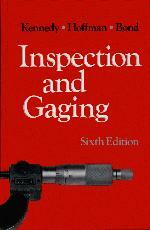 Compares important measuring and gaging systems. The Need and Function of Inspection in Industry. How Specifications Aid the Inspector. Tolerances and Allowances. How Standards Aid the Inspection. Basic Principles and Techniques of Measurement. Comparison and Fixed Gages. Surface Plate Methods and Equipment. Optical Measuring and Inspection Equipment . Gaging and Inspection of Screw Threads. Special Measuring and Inspection Problems. Gage Checking and Calibration. Measuring in Millionths. Coordinate Measuring Machines. Automatic Gaging. Nondestructive Testing.